MarketGoo is an easy to use Search Engine Optimization (SEO) tool. It helps you to optimize your website for search engines like Google, to improve your ranking. An improved ranking leads to more traffic on your website. You don't need to be an expert in SEO to use MarketGoo, or have a lot of technical knowledge. 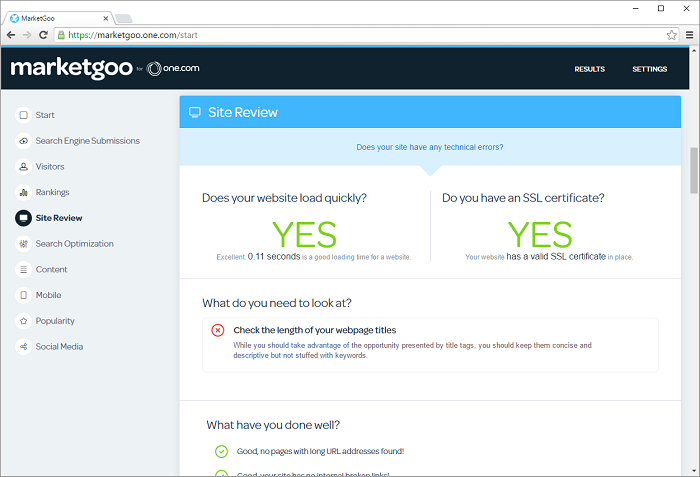 MarketGoo explains in easy to follow steps what you can do to optimize your site and how to go about it. MarketGoo is available as an add-on product when you order a new domain at One.com. You can also add it later from the control panel. Did you sign up for MarketGoo Evolution? 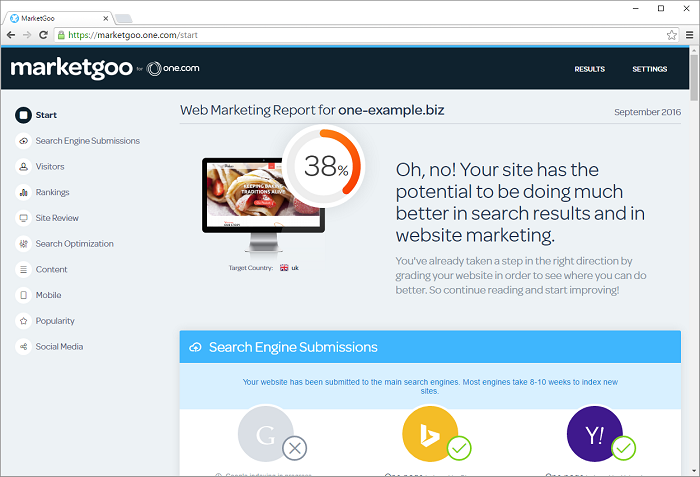 MarketGoo analyzes your website and creates an online Marketing Report in an easy to read overview, divided by the following topics. Your Web Marketing Report starts with your overall score; the higher the score the better. The score is calculated with an algorithm that takes into consideration all aspects of your site that influence SEO. MarketGoo submits your site to the main search engines. You can see how many pages have been indexed by Google, Bing and Yahoo. If your site is brand new, it will usually take 8-10 weeks for your site to be found. It will take at least several months, for your site to get a high ranking. Read more about submitting your site to search engines. Keep track of the amount of visitors you have and where they come from. You can compare it over 15 days, a month or 3 months. It may take a while until you have enough visitors to display any data, especially if your site is new. Check out the One.com Statistics tool if you want more information about your visitors. How do I manage my competitors in MarketGoo? Check out how your site is ranking with the main search engines; Google, Bing and Yahoo. You can see how well you are doing on the keywords you are tracking and also compare this to your competitors. Site review lets you know if your site has any technical issues that you should be aware of, for example a long loading time or a missing SSL certificate. MarketGoo also tells you what you could be better and what is already done well. Under Search Optimization you can find out how friendly your site is to search engines. It checks if the structure of your site is understandable for search engines and whether your titles, links and metadescriptions are in order. Quality content is the most important to improve your ranking, MarketGoo analyzes your content and gives tips on what to improve. It checks for example if you have a blog and contact form on your website or if you are adding new content often enough. An increasing amount of people use mobile devices to search the internet, so it's important that your site also performs well on mobiles or tablets. 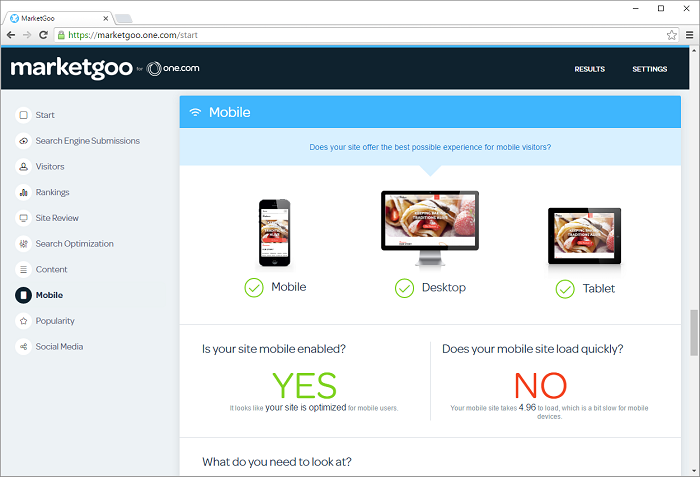 MarketGoo analyzes your site and let's you know whether it's responsive and loads fast enough. Popularity is measured by the amount of links there are from other sites to your website. The more your site is linked to from other places, the more visitors you get. Search engines also give better ranking to sites that have a lot of backlinks. How does your site do in social media? MarketGoo tracks how often your site is shared on Facebook, LinkedIn and Google+. Sharing on social media attracts more visitors and also helps to improve your ranking.